MasterChops is a forum dedicated to connecting the worldwide canine community, all in the spirit of learning. This event promises to challenge existing notions and philosophies about animal health and to start a conversation about the role that food plays in preventing and treating disease. 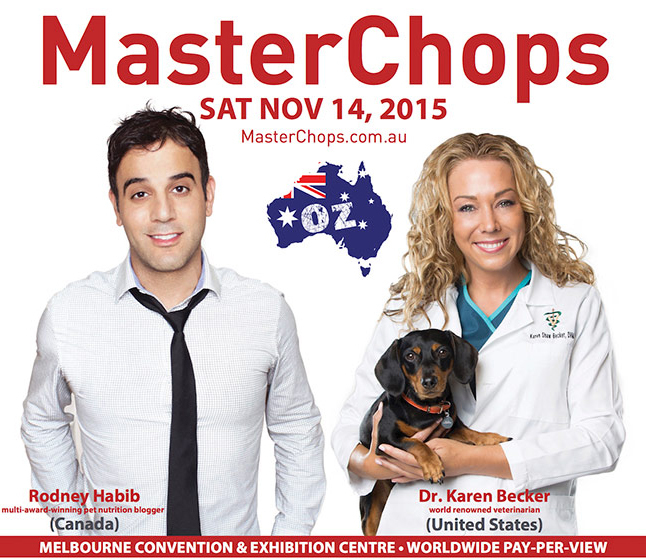 To be held in the heart of Victoria, Australia at the Melbourne Convention & Exhibition Centre, MasterChops will also be available worldwide via live online pay-per-view. Your host Phivo Christodoulou (The Dog Health Guy and director of Augustine Approved) invites some of the brightest minds in canine health to the stage to share their collective experience and wealth of knowledge with you! MasterChops is all about putting the power into your hands and helping you make informed and educated decisions when considering care and nutrition for your best friend. Over time, environmental, lifestyle and nutrition shortfalls can lead to a range of health concerns, some chronic which require ongoing expensive treatment and care; others can be terminal which is devastating for both you and your animal companion. The keynote speakers are international canine experts Rodney Habib (Canada) and Dr Karen Becker (USA). The supporting panel includes Dr Bruce Syme of Vets All Natural (VIC) and Dr Ian Billinghurst - the grandfather of raw feeding and creator of the B.A.R.F. diet (NSW).